Old houses and other buildings may contain concealed ritual objects placed there as protection against witches and evil spirits. These objects have been found in the UK, Continental Europe, Australia and North America. The majority of such objects are found in buildings constructed before 1800 but they have been discovered in buildings dating from as late as the early 20th century. There are no known contemporary documents that describe this bizarre custom. These objects are generally discovered during the course of renovations to the building. Many are found by tradesmen. Typical locations are inside the chimney structure or in other sealed voids within the building. Notify your local heritage authority (but be aware that many people - even those who should know - have never heard of this bizarre practice). Contact Ian Evans at the World of Old Houses to report the find and for further information and suggestions. Photograph the object, in situ if possible, with a tape measure to indicate its size. Record details of the find, including the date, address and circumstances of the discovery, plus the precise location within the building. 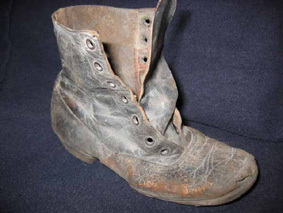 Shoes are the most common objects discovered. 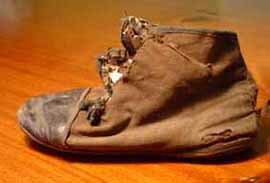 These are typically well-worn and in most cases only a single shoe will be found. 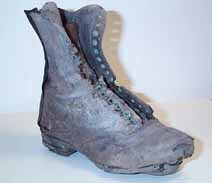 The chimney breast, roof cavity or subfloor area are typical locations for concealed shoes. 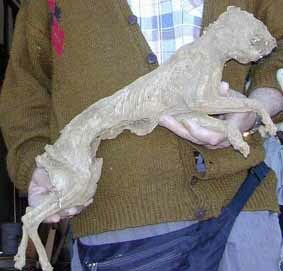 Dried cats may be found in various locations within a building. In the UK they may be found in roof thatching. In Australia they have been discovered in voids near the foundations of the building or in roof cavities. Cats were believed to have an association with witches and it may have been thought that they would serve to decoy evil spirits away from the people of a house. It may also have been thought that they would destroy spiritual vermin in the other world. Witch bottles are stoneware or glass bottles or jugs, filled with urine, heart shapes cut from felt, bent pins and nail clippings. These were buried beneath the hearth or near entrances to buildings. 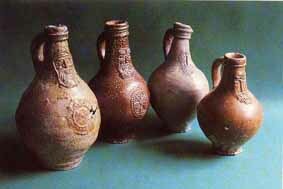 In the UK Bellarmine jugs were used to make witch bottles. A variety of domestic artifacts may be found concealed within the structure of old houses. These may include clothing, clay pipes, dolls, utensils, books, toys and other common household objects. The word apotropaic comes from the Latin for a verse or hymn intended to avert the wrath of angry gods. 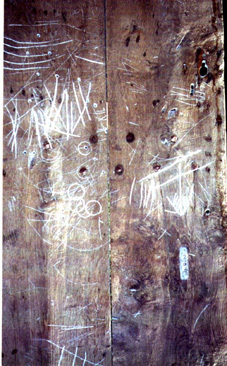 Typical marks invoke the protection of the Virgin Mary by using the letters 'VV" (which stands for Virgin of Virgins), spectacle marks to deflect the evil eye and runic symbols which were considered to have magical powers. These are found on ceilings, often in bedrooms or hallways near bedrooms. 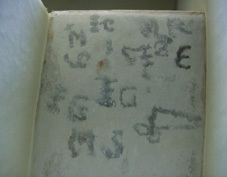 They consist of magical symbols written on the ceiling with the smoke from a candle. For further information about concealed ritual objects contact Brian Hoggard's site, Apotropaios, the Concealed Garments Project at the University of Southampton, or Ruben De Somer's Cat-a-Log.